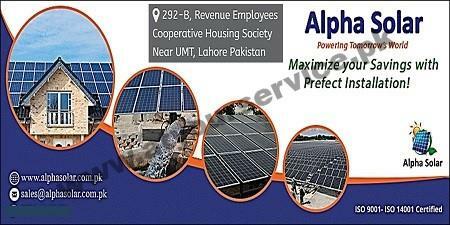 Alpha Solar is located in Revenue Employees Society, Lahore. It offers a range of high quality renewable energy solutions to domestic, commercial & Industrial clients. It specializes in design, manufacture, supply and installation of high quality solar electricity, solar hot water, solar water pumps, LED street lights and also wind turbine system.